Can social networking beat world hunger? WeFeedBack is a new social networking initiative from the World Food Programme, aiming to harness the power of social networking to combat world hunger. It's a laudable cause, for sure, with the online Feedback Calculator application encouraging well-fed western folk to type in their favourite food and estimate how much it costs – the app will then calculate how many hungry children in a developing country could be fed for the same amount of cash. 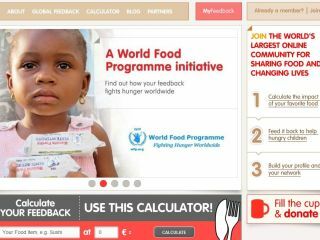 The Feedback Calculator is part of a bigger push by UN's World Food Programme, to push the message that it only costs around 25 cents per (just over 15 pence) per day to feed one child. WeFeedBack, "operates on the notion that the food we take for granted every day could have a major impact on the lives of school children if we decided to share from time to time," notes the WFP's press announcement. "Individual giving is playing an increasingly important role in mobilising funds for the hungry, and WeFeedback is providing a portal into this brave new world of philanthropy," says Nancy Roman, Director of WFP's Communications, Public Policy and Private Partnership Division. "WeFeedback allows people to share food and activate their social networks, transforming something as simple as a cup of coffee or a sandwich into funds that can change the lives of hungry children forever." Crucially, the website and the app are being cleverly integrated with Twitter, Facebook, Google and LinkedIn, with users winning badges and rewards for donating or sharing the news via their own social networks. The World Food Programme is also offering embeddable widgets for bloggers, with plans to release an API later this year which will allow third-party devs to use the "Do Good" functionality on their own sites and within their own apps. The site officially launches this week, already claiming to have given meals to more than 100,000 children, with celeb support from the likes of Christina Aguilera, Drew Barrymore and footballer Kaka.